Nineteenth-century chemists were faced with a particular problem: how to depict the atoms and molecules that are beyond the direct reach of our bodily senses. In visualizing this microworld, these scientists were the first to move beyond high-level philosophical speculations regarding the unseen. 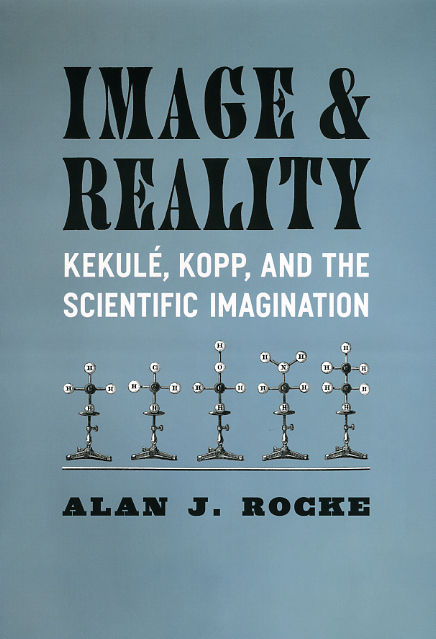 In Image and Reality, Alan Rocke focuses on the community of organic chemists in Germany to provide the basis for a fuller understanding of the nature of scientific creativity. Arguing that visual mental images regularly assisted many of these scientists in thinking through old problems and new possibilities, Rocke uses a variety of sources, including private correspondence, diagrams and illustrations, scientific papers, and public statements, to investigate their ability to not only imagine the invisibly tiny atoms and molecules upon which they operated daily, but to build detailed and empirically based pictures of how all of the atoms in complicated molecules were interconnected. These portrayals of “chemical structures,” both as mental images and as paper tools, gradually became an accepted part of science during these years and are now regarded as one of the central defining features of chemistry. In telling this fascinating story in a manner accessible to the lay reader, Rocke also suggests that imagistic thinking is often at the heart of creative thinking in all fields. Image and Reality is the first book in the Synthesis series, a series in the history of chemistry, broadly construed, edited by Angela N. H. Creager, John E. Lesch, Stuart W. Leslie, Lawrence M. Principe, Alan Rocke, E.C. Spary, and Audra J. Wolfe, in partnership with the Chemical Heritage Foundation. "Exciting and wide-ranging. The writing is so easy and natural that even a non-specialist can read it with delight and understanding. It inspired me." "A masterful account of how chemists crafted a unique visual language of the microworld....Image and Reality offers an impressive discussion of how chemistry relies on such visual thinking as well as how visual imagery contributes to the creative process in science."